Schneider Electric. 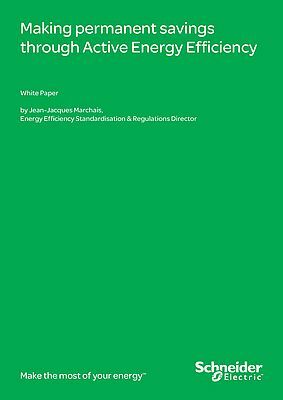 This white paper argues strongly that meeting greenhouse gas emissions targets set within the Kyoto Protocol will fail unless Active Energy Efficiency becomes compulsory. Active Energy Efficiency is defined as effecting permanent change through measurement, monitoring, and control of energy usage. Passive Energy Efficiency is regarded as the installation of countermeasures against thermal losses, the use of low consumption equipment, and so forth. It is vital, but insufficient, to make use of energy-saving equipment and devices such as low-energy lighting. Without proper control, these measures often merely militate against energy losses rather than make a real reduction in energy consumed and in the way it is used. Everything that consumes power must be addressed actively if sustained gains are to be made.